Warmer weather is synonymous with being outdoors, which means entertaining outdoors too. We’ve put together 30 recipes great for BBQs and cookouts. Whether it be a summer holiday or an old-fashioned get-together, the recipes we chose have entertaining in mind. This means little to do indoors the day of and a lot to do with being outside with your guests. It also has a variety of recipes, so you should be able to plan a good portion, if not all of your menu just from this roundup! This smoked lamb shoulder uses 4 simple ingredients and is cooked low and slow. And don’t fret if you don’t have a smoker, it’s possible to turn your grill into one! This recipe gives you some good tips on how to cook your steak to perfection and the chimichurri sauce can be used as a marinade or served with just about any protein. These chicken and bacon skewers have everything – salty, sweet, protein, and veggies. We’d recommend letting the chicken marinate if you have time and preparing the skewers before your guests arrive so all you have to do is put them on the grill. Pulehu? What’s that? It’s a style of Hawaiian cooking over an open fire. These steaks get a nice rub of seasonings and Russ does a great job of explaining how to cook them using a charcoal or gas grill. Cilantro, garlic, and lime sound like a flavor match made in heaven for shrimp. This recipe only serves two, but it’s pretty simple to scale up. These probably wouldn’t hurt from prepping ahead of time and letting the flavors meld even more either. Instead of making the bacon separately and using it as a topping, this burger adds the bacon right into the meat mixture. Genius, if you ask us! Char-Siu is traditionally made with pork, but this recipe uses nice and tender chicken thighs. Make the sauce and marinate the chicken the night before or early in the morning. While lobster gets a fancy rep, it’s pretty simple to cook. Throw it on the grill and let it cook in the lemon butter. The greatest part? No utensils required while eating! We have a slight obsession with ribs over here, but we used restraint and only included one in this roundup. These dry rubbed ribs look so delicious and tender. You put them in the oven, set a timer, and spend time outside while they are cooking. Then you finish them on the grill for a nice char. If you don’t have a grill, or you are worried about having everything fit, this is where the slow cooker can work its magic. While the pulled pork is not traditionally smoked, the flavors and essence is spot on. A mushroom pâté is a light appetizer perfect for snacking while the main courses cook. It’s AIP-friendly, vegetarian and vegan. We know almost every BBQ has a potato salad, so why not change things up a bit? This Ensalada Rusa or “Russian Salad” is a Spanish version of a potato salad. It’s full of carrots, pickles, olives, and tuna. Don’t let that last ingredient deter you – it’s yummy! It also has lots of substitution ideas to work for any dietary needs. This recipe’s name says it all – it’s loaded! All of the ingredients play a part and create a wonderful combination of flavors and textures. And it was made for a potluck so the recipe is ready to feed a crowd. This salad is light, refreshing, and the flavors play well when paired with a grilled piece of meat. It really is a perfect BBQ accompaniment. It’s even supposed to sit up to 30 minutes to let the flavors meld, so that is a bonus when it comes to prepping. Fries at a BBQ? We say yes, please! We love that they aren’t made from the more traditional potato, and are kid and AIP friendly. Take advantage of beautiful summer tomatoes for this recipe. The creaminess of the avocado easily stands in for the typical mozzarella found in a caprese and the pairing is just perfect. If you like to stick to the classics, then this recipe is for you! Although the recipe doesn’t mention it, you may be able to use sweet potatoes if you don’t include white potatoes in your diet. If you’ve never tried grilled romaine, you’re missing out! The charred-heat really transforms this leafy green into a whole new vegetable. Rather than stick to the go-to dressings and salad fixings, we think this recipe adds bold flavors that will impress your guests. You can’t have a cookout without grilled vegetables, the ones that are marinated and grilled to perfection are so satisfying. This recipe uses a variety of vegetables, and we like that you can choose whatever works for you. This recipe is great for a heartier side dish. You can grill the potatoes and then toss them in the lemon vinaigrette right before serving. A classic dessert turned Paleo. And just in case you’re wondering, these aren’t loaded with sugar, which is a huge plus in our book. They use 2 tablespoons of coconut sugar for a whole batch and really let the strawberries standout. They are also nut-free. Nothing is quite as yummy as a sweet and tart dessert – that’s bite-sized! Michelle is a genius and uses her cookie base as the tartlet, so there’s no need to worry about baking Paleo pastry. We’d make everything ahead and assemble them when you are ready to serve. This low-carb dessert is great for kids and adults to help cool down during those summer days. If you don’t have popsicle molds, you can make mini ones using an ice cube tray. Fruit salad is a summer staple and this one has a delicious honey and lime dressing. If you want to go the extra step and make the cinnamon sugar chips, we are sure your party-goers will devour them. Frosés have been taking over and just because you’re Paleo doesn’t mean you can’t partake in the trend. This slushie has an alcoholic or non-alcoholic option, leaving the choice entirely up to you. As a refreshing drink try serving this keto sparkling lemonade. It would be fun to have a drink station with other fruits too, so guests can assemble their own to their liking. Bring the cocktail bar outside to your BBQ! Here are 3 non-alcoholic mocktails with unique flavor combinations like cucumber chamomile or spiced ginger fizz. Maybe you already have your protein picked out and you’re just looking for something to jazz it up a bit. This barbecue sauce is a mustard-vinegar base, something you may not have tried before depending on where you are from. Treat it as you would a tomato-based sauce and get grilling! Channeling Italian flavors, this recipes is great as an appetizer dip or a topping for just about any protein. 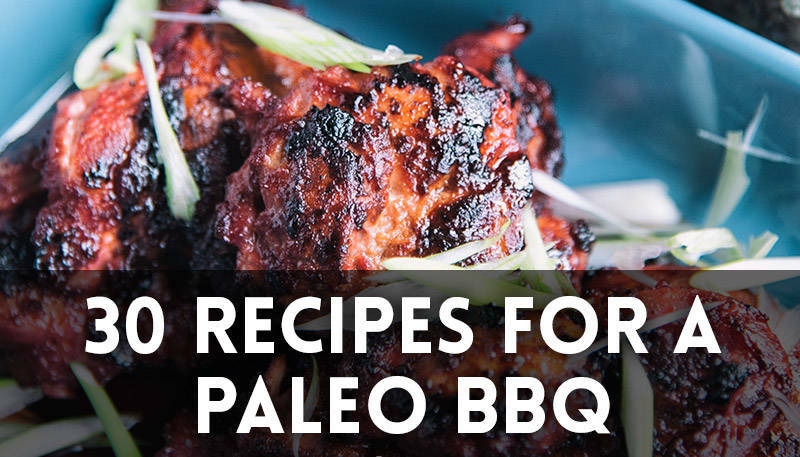 BBQ sauce – it’s a staple condiment, but finding a pre-made barbecue sauce that isn’t full of non-Paleo ingredients is hard. We wouldn’t ask you to give up such a thing, so here is a recipe that uses dates as a sweetener and is so tasty you’ll probably keep it on hand for future meals.